1 A None No Power Seat 1 A is a standard First Class seat at a bulkhead that transforms into a fully flat bed. United's Polaris inflight service is featured while seated here. The close proximity to the galley area might be bothersome. 1 C None No Power Seat 1 C is a standard First Class seat at a bulkhead that transforms into a fully flat bed. United's Polaris inflight service is featured while seated here. The close proximity to the galley area might be bothersome. 1 H None No Power Seat 1 H is a standard First Class seat at a bulkhead that transforms into a fully flat bed. United's Polaris inflight service is featured while seated here. The close proximity to the galley area might be bothersome. 1 K None No Power Seat 1 K is a standard First Class seat at a bulkhead that transforms into a fully flat bed. United's Polaris inflight service is featured while seated here. The close proximity to the galley area might be bothersome. 10 A None No Power Seat 10 A is a standard Business Class seat facing a bulkhead that transforms into a fully flat bed. There is no floor storage available for use during take-off and landing. The seat has a misaligned window. 10 B None No Power Seat 10 B is a standard Business Class seat facing a bulkhead that transforms into a fully flat bed. There is no floor storage available for use during take-off or landing. 10 C None No Power Seat 10 C is a standard Business Class seat that transforms into a fully flat bed. There is no floor storage available for use during take-off or landing. 10 D None No Power Seat 10 D is a standard Business Class seat that transforms into a fully flat bed. There is no floor storage available for use during take-off or landing. 10 G None No Power Seat 10 G is a standard Business Class seat that transforms into a fully flat bed. There is no floor storage available for use during take-off or landing. 10 H None No Power Seat 10 H is a standard Business Class seat that transforms into a fully flat bed. There is no floor storage available for use during take-off or landing. 10 J None No Power Seat 10 J is a standard Business Class seat facing a bulkhead that transforms into a fully flat bed. There is no floor storage available for use during take-off or landing. 10 K None No Power Seat 10 K is a standard Business Class seat facing a bulkhead that transforms into a fully flat bed. There is no floor storage available for use during take-off and landing. The seat has a misaligned window. 19 D None No Power Seat 19 D may have restricted legroom due to the position of the Bulkhead. Bassinets are typically located at the bulkhead rows and there may be infants seated in this area. The tray table is in the armrest, making the armrest immovable and slightly reducing seat width. There is no floor storage for this seat during take-off and landing. 19 E None No Power Seat 19 E may have restricted legroom due to the position of the Bulkhead. Bassinets are typically located at the bulkhead rows and there may be infants seated in this area. The tray table is in the armrest, making the armrest immovable and slightly reducing seat width. There is no floor storage for this seat during take-off and landing. 19 G None No Power Seat 19 G may have restricted legroom due to the position of the Bulkhead. Bassinets are typically located at the bulkhead rows and there may be infants seated in this area. The tray table is in the armrest, making the armrest immovable and slightly reducing seat width. There is no floor storage for this seat during take-off and landing. 2 A None No Power Seat 2 A is a standard First Class seat that transforms into a fully flat bed. United's Polaris inflight service is featured while seated here. 2 C None No Power Seat 2 C is a standard First Class seat that transforms into a fully flat bed. United's Polaris inflight service is featured while seated here. 2 H None No Power Seat 2 H is a standard First Class seat that transforms into a fully flat bed. United's Polaris inflight service is featured while seated here. 2 K None No Power Seat 2 K is a standard First Class seat that transforms into a fully flat bed. United's Polaris inflight service is featured while seated here. 20 A None No Power Seat 20 A has extra legroom due to the position of the Bulkhead. Bassinets are typically located at the bulkhead rows, and there may be infants seated in this section. The tray table is in the armrest, making the armrest immovable and slightly reducing seat width. There is no floor storage for this seat during take-off and landing. 20 B None No Power Seat 20 B has extra legroom due to the position of the Bulkhead. Bassinets are typically located at the bulkhead rows, and there may be infants seated in this section. The tray table is in the armrest, making the armrest immovable and slightly reducing seat width. There is no floor storage for this seat during take-off and landing. 20 D None No Power Seat 20 D is a standard Economy Plus seat. 20 E None No Power Seat 20 E is a standard Economy Plus seat. 20 G None No Power Seat 20 G is a standard Economy Plus seat. 20 J None No Power Seat 20 J has extra legroom due to the position of the Bulkhead. Bassinets are typically located at the bulkhead rows, and there may be infants seated in this section. The tray table is in the armrest, making the armrest immovable and slightly reducing seat width. There is no floor storage for this seat during take-off and landing. 20 K None No Power Seat 20 K has extra legroom due to the position of the Bulkhead. Bassinets are typically located at the bulkhead rows, and there may be infants seated in this section. The tray table is in the armrest, making the armrest immovable and slightly reducing seat width. There is no floor storage for this seat during take-off and landing. 21 A None No Power Seat 21 A is a standard Economy Plus seat. 21 B None No Power Seat 21 B is a standard Economy Plus seat. 21 C None No Power Seat 21 C has even more legroom than the standard Economy Plus seat, due to the missing seat in front. There is no floor storage for this seat during take-off and landing. Passengers tend to bump into this seat as they pass by. 21 D None No Power Seat 21 D is a standard Economy Plus seat. 21 E None No Power Seat 21 E is a standard Economy Plus seat. 21 G None No Power Seat 21 G is a standard Economy Plus seat. 21 H None No Power Seat 21 H has even more legroom than the standard Economy Plus seat, due to the missing seat in front. There is no floor storage for this seat during take-off and landing. Passengers tend to bump into this seat as they pass by. 21 J None No Power Seat 21 J is a standard Economy Plus seat. 21 K None No Power Seat 21 K is a standard Economy Plus seat. 22 A None No Power Seat 22 A is a standard Economy Plus seat. 22 B None No Power Seat 22 B is a standard Economy Plus seat. 22 C None No Power Seat 22 C is a standard Economy Plus seat. 22 D None No Power Seat 22 D is a standard Economy Plus seat. 22 E None No Power Seat 22 E is a standard Economy Plus seat. 22 G None No Power Seat 22 G is a standard Economy Plus seat. 22 H None No Power Seat 22 H is a standard Economy Plus seat. 22 J None No Power Seat 22 J is a standard Economy Plus seat. 22 K None No Power Seat 22 K is a standard Economy Plus seat. 23 A None No Power Seat 23 A is a standard Economy Plus seat. 23 B None No Power Seat 23 B is a standard Economy Plus seat. 23 C None No Power Seat 23 C is a standard Economy Plus seat. 23 D None No Power Seat 23 D is a standard Economy Plus seat. 23 E None No Power Seat 23 E is a standard Economy Plus seat. 23 G None No Power Seat 23 G is a standard Economy Plus seat. 23 H None No Power Seat 23 H is a standard Economy Plus seat. 23 J None No Power Seat 23 J is a standard Economy Plus seat. 23 K None No Power Seat 23 K is a standard Economy Plus seat. 24 A None No Power Seat 24 A is a standard Economy Plus seat. 24 B None No Power Seat 24 B is a standard Economy Plus seat. 24 C None No Power Seat 24 C is a standard Economy Plus seat. 24 D None No Power Seat 24 D is a standard Economy Plus seat. 24 E None No Power Seat 24 E is a standard Economy Plus seat. 24 G None No Power Seat 24 G is a standard Economy Plus seat. 24 H None No Power Seat 24 H is a standard Economy Plus seat. 24 J None No Power Seat 24 J is a standard Economy Plus seat. 24 K None No Power Seat 24 K is a standard Economy Plus seat. 25 A None No Power Seat 25 A is a standard Economy Plus seat. 25 B None No Power Seat 25 B is a standard Economy Plus seat. 25 C None No Power Seat 25 C is a standard Economy Plus seat. 25 D None No Power Seat 25 D is a standard Economy Plus seat. 25 E None No Power Seat 25 E is a standard Economy Plus seat. 25 G None No Power Seat 25 G is a standard Economy Plus seat. 25 H None No Power Seat 25 H is a standard Economy Plus seat. 25 J None No Power Seat 25 J is a standard Economy Plus seat. 25 K None No Power Seat 25 K is a standard Economy Plus seat. 26 A None No Power Seat 26 A is a standard Economy Plus seat. 26 B None No Power Seat 26 B is a standard Economy Plus seat. 26 C None No Power Seat 26 C is a standard Economy Plus seat. 26 D None No Power Seat 26 D is a standard Economy Plus seat. 26 E None No Power Seat 26 E is a standard Economy Plus seat. 26 G None No Power Seat 26 G is a standard Economy Plus seat. 26 H None No Power Seat 26 H is a standard Economy Plus seat. 26 J None No Power Seat 26 J is a standard Economy Plus seat. 26 K None No Power Seat 26 K is a standard Economy Plus seat. 27 A None No Power Seat 27 A is a standard Economy Plus seat. 27 B None No Power Seat 27 B is a standard Economy Plus seat. 27 C None No Power Seat 27 C is a standard Economy Plus seat. 27 D None No Power Seat 27 D is a standard Economy Plus seat. 27 E None No Power Seat 27 E is a standard Economy Plus seat. 27 G None No Power Seat 27 G is a standard Economy Plus seat. 27 H None No Power Seat 27 H is a standard Economy Plus seat. 27 J None No Power Seat 27 J is a standard Economy Plus seat. 27 K None No Power Seat 27 K is a standard Economy Plus seat. 28 A None No Power Seat 28 A is a standard Economy Plus seat. 28 B None No Power Seat 28 B is a standard Economy Plus seat. 28 C None No Power Seat 28 C is a standard Economy Plus seat. 28 D None No Power Seat 28 D is a standard Economy Plus seat. 28 E None No Power Seat 28 E is a standard Economy Plus seat. 28 G None No Power Seat 28 G is a standard Economy Plus seat. 28 H None No Power Seat 28 H is a standard Economy Plus seat. 28 J None No Power Seat 28 J is a standard Economy Plus seat. 28 K None No Power Seat 28 K is a standard Economy Plus seat. 29 A None No Power Seat 29 A is a standard Economy Plus seat. 29 B None No Power Seat 29 B is a standard Economy Plus seat. 29 C None No Power Seat 29 C is a standard Economy Plus seat. 29 D None No Power Seat 29 D is a standard Economy Plus seat. 29 E None No Power Seat 29 E is a standard Economy Plus seat. 29 G None No Power Seat 29 G is a standard Economy Plus seat. 29 H None No Power Seat 29 H is a standard Economy Plus seat. 29 J None No Power Seat 29 J is a standard Economy Plus seat. 29 K None No Power Seat 29 K is a standard Economy Plus seat. 30 A None No Power Seat 30 A is a standard Economy Plus seat. There may be limited storage in the overhead bin since this may be used for emergency equipment. 30 B None No Power Seat 30 B is a standard Economy Plus seat. There may be limited storage in the overhead bin since this may be used for emergency equipment. 30 C None No Power Seat 30 C is a standard Economy Plus seat, however this seat is often bumped by service carts or others passing by due to the transition from three seats to two seats behind. The close proximity to the lavatory may be bothersome. There may be limited storage in the overhead bin since this may be used for emergency equipment. 30 D None No Power Seat 30 D is in the last row of the section and may have limited recline. The close proximity to the lavatory may be bothersome. There may be limited storage in the overhead bin since this may be used for emergency equipment. 30 E None No Power Seat 30 E is in the last row of the section and may have limited recline. The close proximity to the lavatory may be bothersome. There may be limited storage in the overhead bin since this may be used for emergency equipment. 30 G None No Power Seat 30 G is in the last row of the section and may have limited recline. The close proximity to the lavatory may be bothersome. There may be limited storage in the overhead bin since this may be used for emergency equipment. 30 H None No Power Seat 30 H is a standard Economy Plus seat, however this seat is often bumped by service carts or others passing by due to the transition from three seats to two seats behind. The close proximity to the lavatory may be bothersome. There may be limited storage in the overhead bin since this may be used for emergency equipment. 30 J None No Power Seat 30 J is a standard Economy Plus seat. There may be limited storage in the overhead bin since this may be used for emergency equipment. 30 K None No Power Seat 30 K is a standard Economy Plus seat. There may be limited storage in the overhead bin since this may be used for emergency equipment. 31 A None No Power Seat 31 A is in the last row of the section and may have limited recline due to the Exit Row behind. The close proximity to the lavatory may be bothersome. 31 B None No Power Seat 31 B is in the last row of the section and may have limited recline due to the Exit Row behind. The close proximity to the lavatory may be bothersome. 31 J None No Power Seat 31 J is in the last row of the section and may have limited recline due to the Exit Row behind. The close proximity to the lavatory may be bothersome. 31 K None No Power Seat 31 K is in the last row of the section and may have limited recline due to the Exit Row behind. The close proximity to the lavatory may be bothersome. 33 A None No Power Seat 33 A has missing a window but may have some extra legroom due to the Exit Row in front, however the Exit door may protrude into some of this space. The close proximity to the lavatories may be bothersome. The tray table is in the armrest, making the armrest immovable and slightly reducing seat width. 33 B None No Power Seat 33 B may have some extra legroom due to the Exit Row in front, however the close proximity to the lavatories may be bothersome. The tray table is in the armrest, making the armrest immovable and slightly reducing seat width. 33 C None No Power Seat 33 C may have some extra legroom due to the Exit Row in front, however the close proximity to the lavatories may be bothersome. The tray table is in the armrest, making the armrest immovable and slightly reducing seat width. 33 H None No Power Seat 33 H may have some extra legroom due to the Exit Row in front, however the close proximity to the lavatories may be bothersome. The tray table is in the armrest, making the armrest immovable and slightly reducing seat width. 33 J None No Power Seat 33 J may have some extra legroom due to the Exit Row in front, however the close proximity to the lavatories may be bothersome. The tray table is in the armrest, making the armrest immovable and slightly reducing seat width. 33 K None No Power Seat 33 K has missing a window but may have some extra legroom due to the Exit Row in front, however the Exit door may protrude into some of this space. The close proximity to the lavatories may be bothersome. The tray table is in the armrest, making the armrest immovable and slightly reducing seat width. 34 D None No Power Seat 34 D may have restricted legroom due to the position of the Bulkhead. The close proximity to the lavatory may be bothersome. Passengers with infants are often seated at the bulkhead. The tray table is in the armrest, making the armrest immovable and slightly reducing seat width. There is no floor storage for this seat during take-off and landing. 34 E None No Power Seat 34 E may have restricted legroom due to the position of the Bulkhead. The close proximity to the lavatory may be bothersome. Passengers with infants are often seated at the bulkhead. The tray table is in the armrest, making the armrest immovable and slightly reducing seat width. There is no floor storage for this seat during take-off and landing. 34 G None No Power Seat 34 G may have restricted legroom due to the position of the Bulkhead. The close proximity to the lavatory may be bothersome. Passengers with infants are often seated at the bulkhead. The tray table is in the armrest, making the armrest immovable and slightly reducing seat width. There is no floor storage for this seat during take-off and landing. 41 G None No Power Seat 41 G is a standard Economy Class seat. 42 G None No Power Seat 42 G is a standard Economy Class seat. 43 G None No Power Seat 43 G is a standard Economy Class seat. 44 D None No Power Seat 44 D is an Economy Class seat, however the proximity to the lavatory and galley may be bothersome. 44 G None No Power Seat 44 G is an Economy Class seat, however the proximity to the lavatory and galley may be bothersome. 45 A None No Power Seat 45 A is in the last row of the plane and may have limited recline. The close proximity to the lavatories and galley may be bothersome. 45 B None No Power Seat 45 B is in the last row of the plane and may have limited recline. The close proximity to the lavatories and galley may be bothersome. 45 C None No Power Seat 45 C is in the last row of the plane and may have limited recline. The close proximity to the lavatories and galley may be bothersome. Other flyers tend to bump into this seat. 45 D None No Power Seat 45 D is a standard Economy Class seat. 45 G None No Power Seat 45 G is a standard Economy Class seat. 45 H None No Power Seat 45 H is in the last row of the plane and may have limited recline. The close proximity to the lavatories and galley may be bothersome. Other flyers tend to bump into this seat. 45 J None No Power Seat 45 J is in the last row of the plane and may have limited recline. The close proximity to the lavatories and galley may be bothersome. 45 K None No Power Seat 45 K is in the last row of the plane and may have limited recline. The close proximity to the lavatories and galley may be bothersome. 46 D None No Power Seat 46 D is in the last row of the plane and may have limited recline. The close proximity to the lavatories and galley may be bothersome. 46 E None No Power Seat 46 E is in the last row of the plane and may have limited recline. The close proximity to the lavatories and galley may be bothersome. 46 G None No Power Seat 46 G is in the last row of the plane and may have limited recline. The close proximity to the lavatories and galley may be bothersome. 6 A None No Power Seat 6 A is a standard Business Class seat facing a bulkhead that transforms into a fully flat bed. Window seats are recommended for privacy in row 6 as all aisle seats face other passengers due to the alternating forward and backwards layout of this Business Class cabin. There is no floor storage available for use during take-off and landing. 6 B None No Power Seat 6 B is a standard Business Class seat facing a bulkhead that transforms into a fully flat bed. There is no floor storage available for use during take-off and landing. 6 C None No Power Seat 6 C is a standard Business Class seat that transforms into a fully flat bed. There is no floor storage available for use during take-off and landing. 6 D None No Power Seat 6 D is a standard Business Class seat that transforms into a fully flat bed. There is no floor storage available for use during take-off and landing. 6 G None No Power Seat 6 G is a standard Business Class seat that transforms into a fully flat bed. There is no floor storage available for use during take-off and landing. 6 H None No Power Seat 6 H is a standard Business Class seat that transforms into a fully flat bed. There is no floor storage available for use during take-off and landing. 6 J None No Power Seat 6 J is a standard Business Class seat facing a bulkhead that transforms into a fully flat bed. There is no floor storage available for use during take-off and landing. 6 K None No Power Seat 6 K is a standard Business Class seat facing a bulkhead that transforms into a fully flat bed. Window seats are recommended for privacy in row 6 as all aisle seats face other passengers due to the alternating forward and backwards layout of this Business Class cabin. There is no floor storage available for use during take-off and landing. 7 A None No Power Seat 7 A is a standard Business Class seat facing a bulkhead that transforms into a fully flat bed. Flyers have reported that this seat has a bit more privacy. There is no floor storage available for use during take-off and landing. The close proximity to the galley and lavatory area might be bothersome. 7 B None No Power Seat 7 B is a standard Business Class seat facing a bulkhead that transforms into a fully flat bed. There is no floor storage available for use during take-off and landing. The close proximity to the galley and lavatory area might be bothersome. 7 C None No Power Seat 7 C is a standard Business Class seat that transforms into a fully flat bed. There is no floor storage available for use during take-off and landing. The close proximity to the galley and lavatory area might be bothersome. 7 D None No Power Seat 7 D is a standard Business Class seat that transforms into a fully flat bed. There is no floor storage available for use during take-off and landing. The close proximity to the galley and lavatory area might be bothersome. 7 G None No Power Seat 7 G is a standard Business Class seat that transforms into a fully flat bed. There is no floor storage available for use during take-off and landing. The close proximity to the galley and lavatory area might be bothersome. 7 H None No Power Seat 7 H is a standard Business Class seat that transforms into a fully flat bed. There is no floor storage available for use during take-off and landing. The close proximity to the galley and lavatory area might be bothersome. 7 J None No Power Seat 7 J is a standard Business Class seat facing a bulkhead that transforms into a fully flat bed. There is no floor storage available for use during take-off and landing. The close proximity to the galley and lavatory area might be bothersome. 7 K None No Power Seat 7 K is a standard Business Class seat facing a bulkhead that transforms into a fully flat bed. Flyers have reported that this seat has a bit more privacy. There is no floor storage available for use during take-off and landing. The close proximity to the galley and lavatory area might be bothersome. 8 A None No Power Seat 8 A is a standard Business Class seat that transforms into a fully flat bed. There is no floor storage available for use during take-off and landing. 8 B None No Power Seat 8 B is a standard Business Class seat that transforms into a fully flat bed. There is no floor storage available for use during take-off and landing. 8 C None No Power Seat 8 C is a standard Business Class seat facing a bulkhead that transforms into a fully flat bed. There is no floor storage available for use during take-off and landing. The close proximity to the galley and lavatory area might be bothersome. 8 D None No Power Seat 8 D is a standard Business Class seat facing a bulkhead that transforms into a fully flat bed. There is no floor storage available for use during take-off and landing. The close proximity to the galley and lavatory area might be bothersome. 8 G None No Power Seat 8 G is a standard Business Class seat facing a bulkhead that transforms into a fully flat bed. There is no floor storage available for use during take-off and landing. The close proximity to the galley and lavatory area might be bothersome. 8 H None No Power Seat 8 H is a standard Business Class seat facing a bulkhead that transforms into a fully flat bed. There is no floor storage available for use during take-off and landing. The close proximity to the galley and lavatory area might be bothersome. 8 J None No Power Seat 8 J is a standard Business Class seat that transforms into a fully flat bed. There is no floor storage available for use during take-off and landing. 8 K None No Power Seat 8 K is a standard Business Class seat that transforms into a fully flat bed. There is no floor storage available for use during take-off and landing. 9 A None No Power Seat 9 A is a standard Business Class seat that transforms into a fully flat bed. There is no floor storage available for use during take-off or landing. 9 B None No Power Seat 9 B is a standard Business Class seat that transforms into a fully flat bed. There is no floor storage available for use during take-off or landing. 9 C None No Power Seat 9 C is a standard Business Class seat that transforms into a fully flat bed. There is no floor storage available for use during take-off or landing. 9 D None No Power Seat 9 D is a standard Business Class seat that transforms into a fully flat bed. There is no floor storage available for use during take-off or landing. 9 G None No Power Seat 9 G is a standard Business Class seat that transforms into a fully flat bed. There is no floor storage available for use during take-off or landing. 9 H None No Power Seat 9 H is a standard Business Class seat that transforms into a fully flat bed. There is no floor storage available for use during take-off or landing. 9 J None No Power Seat 9 J is a standard Business Class seat that transforms into a fully flat bed. There is no floor storage available for use during take-off or landing. 9 K None No Power Seat 9 K is a standard Business Class seat that transforms into a fully flat bed. There is no floor storage available for use during take-off or landing. In all classes of this aircraft, there is a wide array of audio entertainment. Additional information may be accessed by clicking here. United offers access to many hours of Audio and Video OnDemand (AVOD), games, and a map on personal LCD screens. Additional information may be accessed by clicking here. An AC power port is located at each seat in Polaris first and Polaris business. There are two outlets for each set of triple seats and one outlet for each set of double seats in Economy. United Airlines offers access to internet service. Connectivity is available for laptops and mobile devices. The service is available once the aircraft reaches 10,000 feet cruising altitude. Click here for more information. Full service meals, snacks, and beverages are available on all United Airlines flights. Type of service depends on class and length of flight. Additional information may be accessed by clicking here. The seat map of this United Airlines 777-200 is configured with Polaris first, Polaris business, Economy Plus, and Economy seating. The aircraft is used on long-haul intercontinental routes. Polaris class on this aircraft features a standard First Class Open Suite seat in Polaris first and a standard Business Class seat in Polaris business. Both transform into a fully flat bed. Polaris inflight service is offered. Economy Plus is offered on this aircraft type. Economy Plus is not a separate class of service but is standard economy with up to 5 inches of extra legroom. These seats are located nearer to the front of the aircraft and passengers in this section will be served first. Charges for these seats will depend on routing and may be purchased at the of booking or check-in. 01/03/19 SFO-LHR. Seat 1A now seems to be used by the crew now as a resting seat for the pilot. 1A's storage bin is used to store supplies and crew bags. My wife and i flew Polaris first in the two center seats 2 C&H (last row of first class). The seat "cabins" are large and comfortable. Frankly reading all of the negative comments here at seat Guru I had misgivings but most of the worst comments are from a year or two ago. We fly first/business class frequently and were excited to fly in these seats. We were not disappointed. Lots of space, plenty of storage room. Seats were large enough to sleep comfortably fully flat (I am 6'2" and 230 lbs). The flight attendant made up the beds for us. We chose this particular flight with connections through Chicago because of the new Polaris lounge. The lounge was ALSO incredible. United lounges have become so pedestrian with mediocre food and crowded that its almost like waiting in the concourse. This first of it's kind Polaris lounge is restricted to international business and first class passengers and Chicago is the standard by which all first class lounges will be judged against in the future. Showers that were Spa like (large, beautifully designed). They even have a two sided door between the shower and the hallway where you can hang your clothes for pressing while showering. There is an area where you can lie down to take a rest and the FOOD is excellent. Both a sit down restaurant where you can order a meal from a menu and and a buffet with delicious offerings. All-in-all a great experience. Dramatic difference between the first class suite and Polaris business on this international flight. There was a dedicated flight attendant crew for this cabin of only 8 seats. The food was exceptional and the seats were, of course fully lie flat. this is the first time i have been able to fully recline in a first class lie flat seat because I am tall. I was not cramped at all and my fee fit well into the space provided. United is lagging behind on business class seating. There is no seat storage available for any personal items. Anything you like to keep with you during the trip needs to be in your lap! This is crazy knowing I had a 14 hour trip from Hong Kong to Chicago in front of me. The 787 seating is slightly better but not up to par with other int'l airlines. The seat itself with the newly added memory foam padding (upon request) is adequate for a overnight journey. Avoid center seats at all cost as it does not give much privacy. Seat 1A (Global First) is bothersome because on a long haul flight (13.5hr for ORD-PVG), your cabin experience is not a pitch dark. With the way the seat is facing, you are always looking toward the bathroom corridor which is always lit. This means if you want to sleep, you will never obtain darkness. HKG-ORD, seat 20A. Roomy bulkhead seat. Served drinks and meals, first. Tilt-up entertainment system worked well; a pen worked better on the touch-screen. Couldn't find the power outlet even though it's supposed to have one. The seat was ok for a basic economy seat. The entertainment system was awful as the touch screen is very hard to use and rarely recognizes your finger. The air conditioning was blasting the entire flight making it freezing and impossible to sleep. The food and service on United was the bare minimum. I typically fly Lufthansa and will be sticking to the them as often as I can. The last row of economy plus on the outside has nice pairs of seats perfect for couples traveling together. The map says "limited recline" but the reline was excellent and appeared the same as all other economy plus seats. 1. often there were ques in front of the toilet 2. there drunken people chatting in front of me 3. the floor is not a straight line here, you have to walk around this seat. Almost every second passenger hit you legs. The crashes into you knees with their buggys. No chance to sleep! Worst seat ever. Duped again! Having no seat in front provides some benefit but bulkhead PREVENTS stretching my legs as is possible in other seats (I'm 6' tall). ???? I flew from IAD to LHR on 8 Aug 2017. About a 6 hour 30 minute flight. My seat 39K was a standard economy seat with no frills other than being a window seat so I could lean to the right and rest my head. I am 6 feet tall and the seat was just ok. Only the fact that I had no one sitting next to me (in the center seat) for the entire flight made the flight tolerable. I got to use both armrest for the whole flight. Horrible seat. Narrower than usual because of folding tray table in armrest. Legroom in principle good, BUT... during meal services, F/As park food cart in front of you, rudely waking you up by bumping into your legs, and making it impossible to stretch them. Should be yellow/red and not considered Y+. During the flight that seat was vibrating for some reason. I mean it was not the normal vibration that sometimes occurs during flight. Just strange. Have you ever wondered how sardines in a tin can feel? Fly United! Never experienced such a tigh knee space on a transatlantic flight. Seats 10 J/K are a joke (a bad joke) for Business class seats. Rear-facing..last row..thin see-through curtain separating Economy seating from Business class. So..no privacy at all...staring into the front-facing seats of the first rows of Economy. We will choose another airline if the 777-200 flies the route we need on United. This is a fantastic seat. On my flight, seat 6B was marked reserved for crew rest and was never occupied at all, so I basically had use of that seat space, too. The seat reclines nicely and the foot rest is adequate and comfortable. All the USB plugs worked fine. Storage compartment is a bit small, but the overhead bin was large enough to make up for it. I'd choose this seat over a first class seat on this plane any day. Seat 2A is a first class seat that faces the galley and the cockpit. On an overnight flight, the 1st class lav is frequently closed off for use by pilots. This requires the FA's to install a metal grate in front of the lav and to stand guard while the pilot uses it. Installing the grate is noisy, and the lights from that area shine in your eyes all flight long if you're sitting in this seat. Although the soft products in Polaris First are nice, they're just putting lipstick on a pig. This seat is hard, the arms and storage areas are worn and the USB plug in this seat does not work. This seat is great for tall people, there is no seat in front of you and there is a ton of leg room. 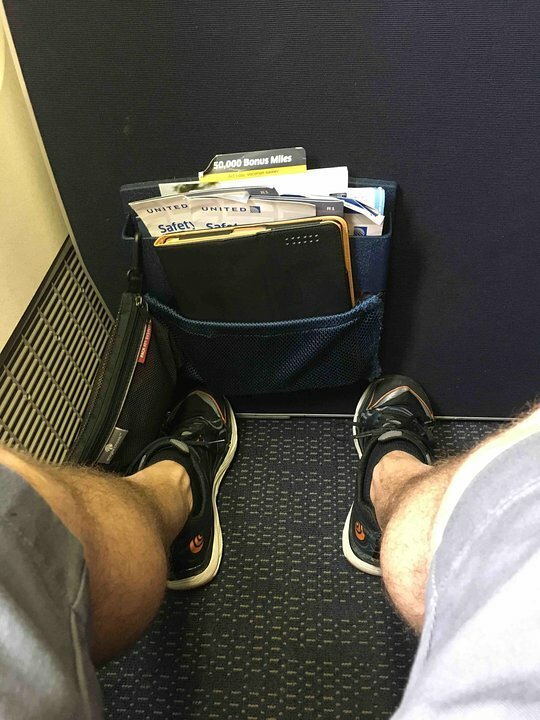 As someone who is 6'6" this was worth every penny on an 8 hour flight. I would recommend this one over the emergency row because you are closer to the front of the plane and get served immediately when the cards go around. The Polaris Business Class is the worse layout: 2-4-2, with the center row facing to the rear of the plane. Every time I looked away from the TV, the guy was looking at me. No room to store wife's purse, laptop, shoes and etc. Seats are not in a herring-bone configuration so that your seat partner has to climb over you to use the restroom. The snack bar is a joke. For breakfast, I got a dinner roll instead of a Danish! 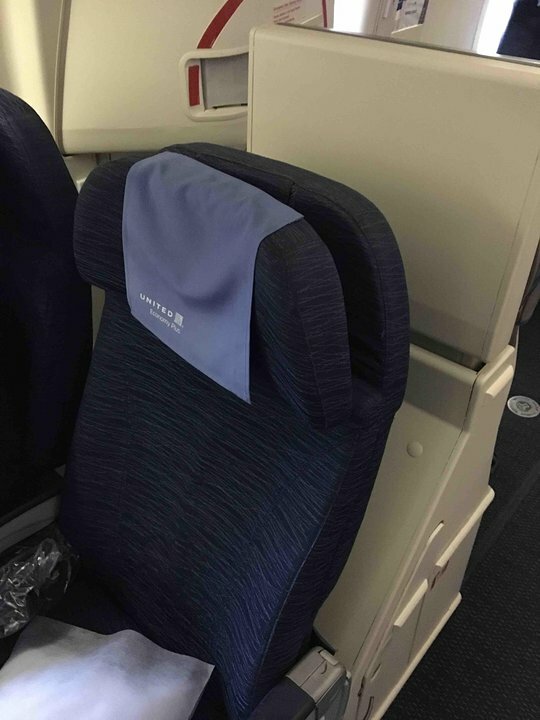 Don't be misunderstood, these seats are not the new United Polaris Business class, they are slowly being added to 777-300ER not for 777-200's like these. Basically this configuration if from the ageing 747 business class, so cramped up in the middle seats where you have 4 in a row with a foot less in fuselage compared to a 747. I took Turkish business 777-300ER they have only 3 in the middle and very spacious and you don't need to climb over the neighbor like these seats where there is no privacy at all being business class. This seat and 6J basically face each other and I have to stare at the passenger on 6J all the time or he was staring at me due to the poor design. If you want real Polaris business try 777-300ER, so far operates between SFO and Hong Kong. Or try the 757-200 or 787-8/9 as they have 2 by 2 and 2 by 2 by 2 respectively so there is better privacy. I picked this seat because of the green color code on the SeatGuru website. However, this seat is not any more private than the others in UA 777-200 business class. Also, this seat is in close proximity to the galley (just like 7B). Contrary to the green color shown on SeatGuru, IMO this should be a yellow seat. I had to listen to the FAs chatting in the galley for a good part of my flight. Flew on March 1, 2017 in 10A and 10B in United Polaris Business class. Be aware that these seats face backwards and you stare right at the passengers in Row 19 for the entire flight, very little privacy. The curtain that is drawn between Business and Premium Economy is a see through curtain. Do not recommend these seats. Just got back from a round trip to Guam via Portland, San Francisco, Hawaii and then on to Guam. If your Boeing had offered a million dollar prize to come up with the worst designed plane in the world it would have been the Boeing 777-200. You now have the seats SO CLOSE TOGETHER that sitting perfectly upright a short persons knees touches the back of the seat of the person in front of them. Your control panel for calling attendants or turning on the light is a disaster. You placed it directly where one would put his elbow. That causes the call light or the overhead reading light to go on and off constantly which bothers everyone. The headrest must be made out of solid hard rubber unlike the soft cloth type usually found in most aircraft. Lastly, the seats only recline about 3 inches which is totally useless for getting any rest or type of comfort. Again not like the better aircraft of others. Will try and choose another plane manufacturer and or airline the next time. A horrible trip. Note that business-class seats on this plane are EIGHT across. This is the principal reason (along with configuration) why United's "Polaris" Business is substandard. The configuration requires people to climb over one another, and the staff doesn't help by making a tremendous amount of noise during the flight. Way too crowded and unpleasant for the price. This seat has got to be the best in buisness class. Better than 7A. Lots of privacy and legroom more than other seats. The only down side is getting over your seat mate in 6B, but still well worth it, also was the first to get my food. Definitely ask for the extra seat pad for sleeping, makes the seat much softer and more comfortable. They don't offer it to you, you have to request it. The person next to me had to climb over me when I was laying flat to get out into the aisle, so any business class seats D and G are awkward when you need to get up. Sleep quality was excellent thanks to the Saks Fifth Avenue bedding materials that are part of the Polaris rebranding. Seat is in a slightly reclined position and quite comfortable, even in "takeoff/landing" preset, which I appreciated. But there is no curtain between First Class and the galley, so galley lights definitely are bothersome in 1A. For the record, the midflight open bar is in the galley for First Class. Another complication with this variant: the access ladder for the crew bunk takes up where one of the First Class lavatories used to be (and V1 still has that lavatory), so First Class is down to a single lavatory. That lone lavatory is also blocked off by a wire barrier when a pilot is entering/leaving the cockpit. I had to backtrack to the business class cabin on one occasion for a free lavatory. Aside from the lavatory and lighting issue, I was extremely pleased with the Polaris experience, and vastly preferred it to my Asiana flight earlier in the itinerary. Good job, United! I flew Economy Plus from Rome to Washington and was satisfied. I fly United a lot, and the service I received was definitely above average for this international flight. F/A's were friendly, 9-across seating does not feel cramped like other airlines' 10-across seating, and the extra E+ legroom was well worth it. I was impressed and would fly United again on this route. I would mark this entire row as yellow. Note that 8ABJK all are directly connected to the bathroom and you can definitely hear the flush. It's also just as close to the galley as 8CDGH. Flew this configuration SFO-AKL. The seat has full recline (as do all seats in row 30) and plenty of overhead storage. The proximity to the lavatory was only an issue after meals when lines began to form, but this was a very minimal inconvenience overall and more to do with the poor design of the aircraft than with the seat location itself (4 lavatories is not sufficient for the number of people in crammed into the economy cabin). In rows 43-45, the aisle narrows. I got bumped into about 15 times during the flight, by flight attendants and other passengers, even while sitting center in my seat with my arm tucked inside the armrest. I'm an average sized male, so it wasn't due to my size. 2-4-2 configuration remains odd. And this seat faces towards the rear, with an invisible half curtain separating it from Economy so you are always looking at someone and someone is always looking at you. 8G is one of the centre two in a row of four business class seats which do recline to a flat bed. I am guessing this is an old configuration because it is certainly lacking as a customer experience. The seating layout means that there is little personal space - it doesn't feel like a business class seat. There is no space for storage of personal items and take off and landing resulted in magazines and personal items falling on the floor. I know there is an upgrade on the fleet and I'd say it is overdue. The service was great - the crew were very attentive. This window seat was very close and facing the engine and extremely noisy. I measured it to be between 90 and 95 decibels for the entire flight. It was very unpleasant that I would not recommend this seat and advise strong ear plugs if you do. I'm 6'8" and had hoped the missing seat in front of 20K would provide the most leg room. Unfortunately due to it being a bulkhead seat there's a divider that prevents you from extending your legs, the picture doesn't show this divider. Tall people - stick to exit row or upgrade to business. Previous comments are accurate. Would like to add that the video console is on a tilt up arm and does not rest parallel. In my particular case the arm would not lock in place rendering the video monitor useless for the entire trip from FRA --> EWR. Cabin crew totally indifferent to the issue, so probably subsequent passengers on this aircraft (# 2477 in the United fleet) will face the same issue. This plane routes back and forth from FRA - EWR - FRA. Flew UA882 back from Tokyo yesterday. United's Global First class is a bad joke (lousy food, service,...) but my main issue was with the seats, which are old, worn and poorly maintained. Velcro had worn off the seat cushions on 1A, so foot-rest cushion kept falling off the frame. Since I am tall enough to need the foot-rest, I had to move to a different (less desirable) seat. No apology or compensation from staff. Built-in headrests make lying-flat next to impossible for tall people unless you beg for extra pillows (hard to get). Unlike UA business-first, Global First has (minimal) storage at seat. Not good, but better than nothing. Video screens old and dim, so hard to see much. One good feature is seat width, which is adequate. Either save money and fly Delta business class (which is better than UA Global First) or splurge and fly a real first class on an asian airline. The legroom on this outer seat (aisle seat) is less since this row is slightly tiltled because of the narrowing of the fuselage that starts here. I assume 43H on the other side has the same problem. Worst business class seats ever. They were all in four along a row, my heart literally sank the moment I stepped on board and I had to re-check my ticket because I was in disbelief. If everyone is lying flat, then you have to climb over them whilst sleeping, not to mention the footwell was tiny so if you're laying down it's too small for your feet and cramped. The service was abysmal, I asked for some snacks and they said they ran out...You're telling me on a 15 hour flight, in business class, they couldn't find some nuts. You would NEVER get that disgraceful service on Virgin Atlantic. I will never ever fly United again. Bassinet for Economy cabin is for seat 19G. Recently flew this 777-200 between EWR-LAX. Only 8 seats in the Global First cabin, which was spacious and comfortable with plenty of overhead storage. The seat (identical to the ones on the 747-400) was very comfy with plenty of little storage nooks and crannies for phone, tablet, water, other reading material, etc. The two FAs working the cabin were friendly and courteous, did not disappear after the meal as is sometimes the case, and made many walk-thrus of the cabin offering beverages, and a warm cookie towards the end of the flight. UA tends to get a lot of bad reviews, but I must say it was a treat to be able to travel transcon this way. Wish Global First was available on more flights on the LAX-EWR-LAX ps route. The seat is rear facing. The recently introduced curtains between C and Y are thin and the FAs serving in Y constantly bump the curtain open, leaving me staring at the passenger in 19D. Got a complimentary upgrade, so shouldn't complain, but... Very narrow seat/bed, armrests at different levels (left and right) resulting in akward position. Need to jump over neighbor to access bathroom. Nowhere to stow ANYTHING. Way too cold -- sweater required. Food uninspiring and description of wine choices has been eliminated from menu -- in Business??? Just did Frankfurt to ohare. we had the front three seats. Im 6 foot 6 and weigh 230. This was beautifull. Yes narrower than a previous first class but the legroom and fold flat bed were fantastic. Power seats. movies, shows, food, drinks.... Well worth the 57000 points I paid. coach was only 27000. less. I had the misfortune of flying on this plane - there is not a good seat in the business class cabin. The seat is narrow, you either have someone trip over you or have to hurdle over someone. There's virtually no space to store even a phone, let alone a bag or laptop. BRUTAL. Whomever thought a 2 4 2 config in biz class was a good idea should be fired. United has really dropped the ball on this. 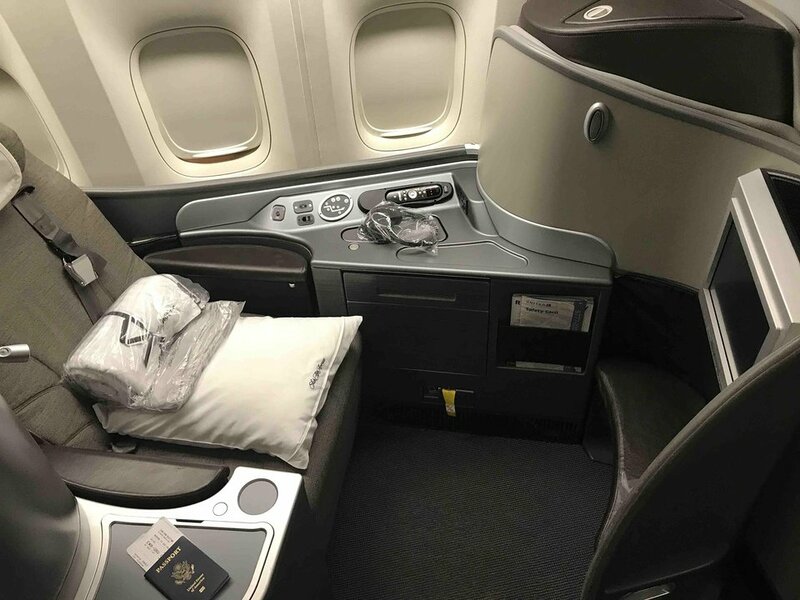 In the interest of making a few extra bucks, they have lowered their long haul business class seats into the realm of premium economy (plus) on carriers like Virgin and Quantas. The best I can describe was the overnight flight to Frankfurt: It was like trying to sleep in the front seat of a 1972 Corvette. My shoulders were too wide to fully recline, and there was ZERO privacy. I'm sure my neighbors enjoyed me watching Saving Private Ryan as they ate their dinners... It made them even more pleasant when people in the middle or window seats have to crawl over sleeping strangers in the middle of the night to use the toilet. I am not saying I will never fly United again--but will chose more wisely in my business-class over water bookings. In business first for the first time. I was quite excited about the lay flat seats, because I was hoping to arrive more refreshed than previous trans-atlantic flights. However the seat wasn't too comfortable. My husband's shoulders were too wide to lay flat on his back so he was cramped to the side- poor guy!. It was also quite difficult to get out of the seat when he was laying flat sleeping- I had to leap over his legs and always ended up bumping him. Luckily it was my husband- if it was a stranger, I would have felt awful waking them repeatedly. The food was good and the FA's were kind and attentive. We didn't have any issues with facing a weird way or looking into the galleys, so this seat may be the best of the whole section. While the staff was pleasant they apologized for now having the first class seat be what used to be the business class seat. I fly Etihad, Asiana, Emirates and they would laugh at this configuration. It is sad to see the US airlines turn business class into a greyhound bus seat and atmosphere. I would make every effort to buy on other airline if they cover the route to get real service and appropriate seating. You know why they are fighting the middle east airlines for getting into the US  they wont compete!. BTW i was served in 1st class with a plastic cup. Flew on this type of plane as a PS flight LAX-EWR. Very uncomfortable for a BusinessFirst seat. Not only does the cabin "feel" cramped, which so many seats on top of each other, the seat is physically narrower than, say, the lie-flat seats on a PS 757. I'll try to avoid this in the future. Flew in 9A/9B with my wife from FRA-IAD. I disagree with other commenters who complain about United's BusinessFirst product - these seats were great! Yes I can see how they might "feel" a little narrower due to the 2-4-2 configuration (and yes I wish United had gone with the herringbone seat layout seen on the 767, plus on Lufthansa and other airlines) but the seats themselves were quite comfortable, and food/drink service was top notch. My only complaints were the front/rear seat layout - it's not bad, but making eye contact with your neighbors might feel a little weird to some, particularly those in 10A/B who have to face economy. Also there's no under-seat storage, but I know that's the case with most lie-flat seats. Beware 7J! This is a rear-facing seat, and with a view directly into the galley. The lights from the galley prevent any semblance of sleep. The galley noise is also an issue. Overall, the configuration of the business cabin is the most ridiculous I have ever seen. To have 4 across with no barriers between people is uncomfortable, and to face people (due to the alternating forward/backward configuration) is just silly, not to mention awkward. I will avoid this equipment for future flights for sure. United makes it appear you are purchasing a modern upgraded seat. Appears United has reduced service and reputation to an all time low. United is off the list for my company until I start seeing at least a couple posts with positive comments. Thank you to all that post comments and pictures regarding their travel experience. For a long haul flight from EWR to Hong Kong, the seat was very narrow and the business class cabin felt very cramped. You are very close to the passenger next to you. Unless you are traveling as a couple this is a very awkward experience. When most airlines now have 6 or 4 seats per row for this type of airplane (most with all aisle access seats), I now understand why United's International business class is rated as one of the worst amongst major airline. Cathay on the same route has a business class seat (and service) that's not even remotely comparable (1-2-1 per row instead of 2-4-2 configuration). I will not fly United on Intl' long haul flights again. If you are with Star Alliance and fly from NY to HK, fly with Asiana through Seoul, it's worth a connection to avoid this cabin. I've had the recent misfortune to take this flight--IAD to LHR--several times, this year--always on the 777-200. 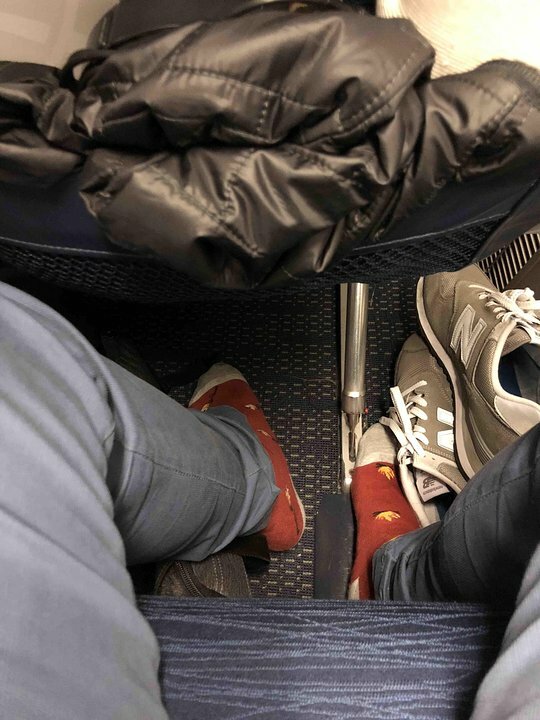 I cannot believe how terrible the "updated" Business First seats are: they are far too narrow, are thinly padded, and have tight footwells that point your feet at impossible angles for comfortable sleep. And who thought that biz travelers would ever warm up to the idea of two middle seats in Business--are they serious? Delta and Virgin Atlantic offer much better biz-class seats for competitive prices. I would avoid this equipment configuration at all costs. Didn't love the configuration of this business class. They really pack you in like sardines. I was practically on top of my neighbor (a stranger) in a way I'm not typically accustomed to in international business. Also, the biz seats are designed in such a way that you have to stow all carry ons in the overhead as if you are in a bulkhead (even if you're not in the bulkhead). The center row (four across) has two middle seats (D and G) with no divider between them, just a small armrest. Middle seats on business class are really BS, and middle seats that close to each other are even weirder. Great if you're traveling with a significant other I guess, but I'd be livid if I got stuck spooning with a stranger in a middle seat after paying a premium. The seats are also quite narrow. I was fine as a female, but if I were a man with broader shoulders those flat beds would've been less than ideal for trying to lie down. Flew round-trip LAX-SYD. I like Global First and find the flat bed seats quite comfortable. Slept 10 hours to Sydney and 8 hours to Los Angeles. The service was excellent and the food was very good. Lots of storage space in the overhead bins and in the suite. Do not think there is a major difference in any of the eight seats in GF; the left (port) side is served first, and the overhead bins are not quite as high above the window seats. The only light that bothered me was the reading light in the seat across from me - that passenger read most of the flight from Sydney to Los Angeles. United is beginning to reconfigure some of their 777s to a domestic configuration. Soon there will be fewer, if any, Global First seats. Hopefully the domestic version will be better than the Hawaii version of their 777. I was lucky enough to get upgraded to this seat, and it was a great flight. The crew was extremely helpful, and really went out of their way for you. The screen is excellent, and the seats recline to whatever position you like, and even offer a back massage to get your blood flowing! I was able to get a few hours of sleep on the lie-flat position, and was offered breakfast as soon as I woke up. The amenities kit offered is very nice, and the pillow is great. These seats also come with excellent noise-cancelling headphones. Only minor remarks are that if you get an isle seat, occasionally your neighbor will need to step in front of your screen to get to the restroom or overhead storage compartment. Dito for the flight attendants passing food or drinks to your neighbor (my neighbor was clearly annoyed by this, but he seemed annoyed by a lot of things). But seriously, are you going to let a few seconds on a 7 hour flight ruin this great way of flying for you? If so, you have bigger problems than your seat selection... Whoever flew Business First in this configuration and commented "It's almost like sitting in Economy Plus", has clearly never done a long haul flight in economy, or has forgotten about it... Yes, you don't have infinite width or privacy in these seats, but can you really expect that in times where ecological measures need to be taken? Don't forget that nowadays, flying (even in business) costs a fraction of what it used to. I flew LAX-LHR on the 777, seat 33A/B/C. The flight was so empty, I had all 3 seats to myself. The biggest downside is that the armrests do not raise up at all, so I was unable to stretch out. There is indeed a missing window. The storage locker for the slide buts slightly into the leg room of 33A, which is unfortunate, but bearable. Definitely B or C is the better option for exit row seating on this plane. The restrooms are right next to you, so you get interrupted all night. The right side of the aircraft does not have restrooms, so that side of the aircraft is definitely better. Overall, I was happy, but I have had a far better exit row experience with other airlines, definitely Virgin Atlantic for the best exit row seating. You end up staring into the economy plus cabin, which can be nice and awkward. United installed curtains, but they are see-thru and useless. Considering these planes are used for long haul flights, the lack of some privacy can be frustrating. The 777 United business class seats are narrower than those I had on Delta or even Eva Air. And you are very close to the "neighbor" sitting next to you. Very annoying! Rows 29 and 30 DEG are crew rest seats. They have virtually unlimited legroom, leg rests, extra cushioned seats, and extra recline. They should be marked as green, as they are some of the best seats (when they're available) in economy plus. Econ plus seat felt as if sitting straight upright even when seat was tilted back. Legroom ok...I am 64 inches tall. United was moving equipment around and instead of the Hawaii 777 we got the international. Decent blanket and pillow, the amenity kit was very cool. Even had a pair of socks in it. Great entertainment system with headphones. The seats face backward and your staring at the galley, but it didn't bother me. Sitting backwards on an airplane is no big deal. You can't even feel it. I'm 6'0 and couldn't get comfortable laying flat but the recline is awesome and I fell asleep. Nice flight from Chicago to Oahu. Wish UA would use this plane more often to Hawaii. Big difference. United Economy Plus has same/less space than Cathay Pacific standard economy. I now see why United is rated the worst international carrier for business class service. This seat that I was in for business class was awful. The person next to me, though very polite and apologetic, had a bladder the size of pea and had to continually step over my seat when I was trying to sleep. I even offered to switch seats but she declined. Due to the fact this flight was a code share with Lufthansa, when I booked the flight with Lufthansa, I assume responsibility for flying on this flight. 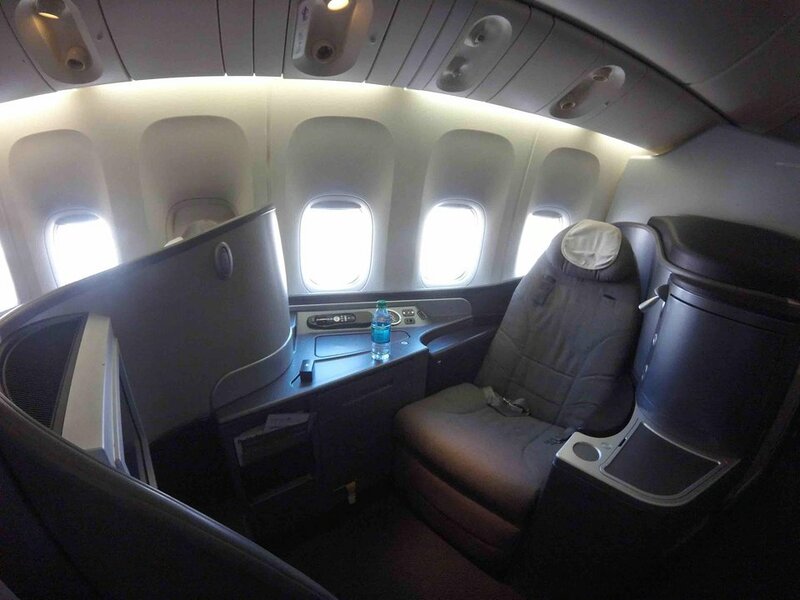 The seat is smaller than most other international airlines and sacrifices comfort for a 777. I have never been a fan of United and this just confirmed my past thoughts as opposed to redeeming itself. The airline prefers to squeezes much out of it's aircraft at the expense of the passengers comfort. Took the flight from SIN-NRT. One of the most comfortable 7 hours flight I had. Wide seat with good legroom making the journey much more bearable. Standard Busienss/First class seat for United. Have seen many comments claiming that these seats are narrow because of the 2-4-2 configuration. I do not think they are any narrower than Busienss/First on United's 767 2-2-2 configuration. In addition, what are people exactly complaining about? The seats lie flat. You get a decent blanket, a pillow that acutally has some density to it, a very nice meal, attentive service, a large screen to watch 100 (or more) movies or TV episodes. To claim that you're in a prison is absurd. Try the last row of economy, next to the window with two people next to you who are asleep. That's prison. United Business/First rocks for all but the terminally misearble. I flew FCO-ORD in In row 9. Plane was quiet and the flat bed was very useful on this 10hr flight. My only complaint is that the BusinessFirst seats are very narrow. Almost as narrow as coach! If you fly BusinessFirst i recomend you upgrade to Global First. Please stop this 2-4-2 Business United. I find Seats 2A and 2K to be the best seats in GlobalFirst. They seem more private and escape the glare from the galley that seats in row 1 might have. I urge folks traveling to accept the foam mattress that is added when they offer to make the seat up for you. It makes the sleeping very comfortable! Proximity to the galley is actually very bothersome, especially when the crew enjoys a good laugh while you are trying to sleep. Rear-facing seat, aligned with the Economy Plus aisle. Not much privacy -- you're practically on display for the forward-facing Economy Plus section. This seat should almost be a green. I flew 10.5 hours on it and I have to say it was a pleasure. This seat reclines. There is a feeling of more space to the right since no rows there. Not a whole lot to complain about the usual bumps from the aisle, nor the close lavs. Only minus for me, the light coming from the galley, not dimmed. Business Class seats on this flight are very uncomfortable due to the narrowness of the seats. This seat facing the galley does tend to be noisy and the lights in the galley make it hard to sleep. Service is also mediocore at best. I was seated in 6J from IAD to IAH on 12/01/14. I found the business section of this aircraft to be uncomfortable in that: 1) the seat was narrow and confining; 2) there are 8 seats across which is why the seats are narrow - 4 seats across in the middle and 2 across from them on each side of the aisle. I can't imagine anyone paying for a business class ticket to be stuck in a middle seat; 3) with alternating rows facing opposite directions it was very uncomfortable to be looking at someone face to face across the aisle. I'm thankful this was a domestic flight and not international. I wouldn't have been able to be comfortable on a long haul flight. If you happen to be on this aircraft, I recommend being in the A/B or J/K seats in rows 6 or 7 which is the forward part of the 2 business cabins. They're also good seats if traveling with someone. When alone you'll get to know the other person very well since the seats are so narrow and so close to each other. My preferred choice is the 777 with 2 cabins - the business first cabin has 5 seats across instead of 8 therefore giving more room to breath and enjoy a long haul flight. As others have mentioned, 33H is NOT a good seat for comfort. In addition to having people step on your feet (I lost count after 10x) on my particular flight the seat didn't recline. With a 10+ hour flight there was no way to get comfortable enough to sleep... extend your feet out and someone was sure to step on them, no comfortable place to cushion your head. I'd take the window anyday... protected by the door and a place to rest your head. 34 D/E/G have no overhead bin. 35 D/E/G bin is reserved for flight crew. This is particularly inconvenient for the passengers seated in 34 D/E/G as there is no floor storage during takeoff/landing. Terrible seat. People will mill about in the space in front of you and at night every time someone uses the rest rooms at night a bright light shines in your face and wakes you up. Despite how it looks on the map, there is a wall directly in front of all the seats in row 20, so there is not significantly more legroom than in the normal Econ Plus seats - plus you get no under-seat storage in front of you, as there is no seat in front of you. For the same reason, the video screen is on a weird extending arm which is very annoying. I do not recommend row 20. Seats 20 A/B are great unless you are over 6' 2" in which case they are torture- the bulkhead is quite close to the seats. For wonderful legroom this seat is indeed great but you do get the feeling of jutting out into the passageway and all through the flight my seat was constantly banged into by either service trollies or other passengers. Never again especially on a long haul flight. The extra legroom in E+ is definitely worth it for long flights. Plus since it doesn't always fill up, you are more likely to get an empty middle seat next to you which is great! The galley noise is really noticeable from this row and occurs throughout the flight. The bathrooms weren't actually much of a problem since there is hardly a queue. I could basically watch what the person next to me was watching (which was a problem because it was a horror film!) The lie-flat beds were nice, but that noise was distracting. The GlobalFirst seats are terrific--lots of storage compartments. However, best to avoid seat 1C, which directly looks into the part of the galley space that had no curtain and bright lights. No other seat had this problem. Firstly, this is the worst business class cabin I have ever seen. They have 8 seats per row, which makes the seats narrow and very uncomfortable. There is no space for anything. And if you are in one of these back facing window like 8K, it seems that you are in a jail. I will try not to fly this is so called "cramped" economy modeled business class of United. The bathroom arrangements on this plane are totally inadequate for a 14 hour journey with 221 people - just 4 toilets. The lines are long and there are always parents with children/babies who need to jump ahead. Plus the bathrooms are not replenished or cleaned so running out of toilet paper is common. This is so bad an arrangement I will actively look to fly a competitor airline to avoid it. This seat has a cold air drift that hits the your face and head. it is very cold regardless of cabin temperature. Although this seat is classified as a "middle" seat, it is on the aisle due to the two person row. You have use of the underseat of 30H as well. Limited recline did not bother us due to the economy plus space, minimal disruption from restroom users. Nice for two people travelling together. These rear facing seats (10A/B 10J/K) look directly at premium economy passengers and the dividing curtain between the two cabins is VERY inadequate and frequently left open. Seat 10 J & K, as well as 10A & B, are rear facing Business seats. The windows are misaligned so don't plan on peering out. Worst of all was facing the economy seats having their camparatively limited meals while we were "enjoying" our five course dinner and much more "sumptuous" breakfast while the economy seat passengers were staring at us through an open-mesh curtain! It was closed but totally see-through. Very uncomfortable! Also, my companion could not lay flat because the seats were not wide enough to accomodate his shoulders. I would not pay business fare for these seats again. All the business class seats on this aircraft are poor for two reasons: (1) Lie flat is not long enough for me 6' 3" and there is not enough room to put your feet - space is too narrow. (2) It is impossible to read or work. The overhead reading light is extremely dim while the extra reading light in back of the seat illuminates just that - the back of the seat and shines light on what you are reading if you are lying flat. That is hardly conducive for working. That second light serves as much use as a human appendix. What was UA thinking? Finally, the seat recline is not completely independent of the foot rest so it is impossible to recline appreciably while still having your feet on the floor. Together this translates into a poor design. Shame on you United. Worth the upgrade to Economy Plus. There's no seat in front of you, so you won't be cramped at all. Perfect for tall people like me. Sometimes, the attendants would bump into me, but I didn't care. Best 14-hour flight ever! In flat bed position, I found the head rest somewhat uncomfortable; it is hard, narrow, and not very movable. But I did get 4-5 hours of sleep. Also, in row 6, the engine noise is quite noticeable. United flies 2 versions of .